Describing a wine can be compared to writing a poem; not as easy as it would seem. Every wine tasting experience is unique because every one of us is an inimitable individual, with our own stock of aromas and flavors in memory and senses of taste and smell different to anyone else’s. Those with a privileged nose are able to identify aromas of substances actually present in the wine. Apart from that, tasters have to explain the impressions the wine created in their mind. For all this reasons, no description of a wine tasting is ever wrong. A suggestion: use words from your hobbies or other areas you know well. I compared describing wine to writing a poem because I am not particularly good at finding rhyming words. You could find wine as exhilarating as hooking the king trout in the river –I can attest this is truly exhilarating - or it could be a flawless performance, a symphony, an ebullient salsa party… I’m sure you have your own bank of experiences. When it comes to the actual words, wine tasters need to borrow their vocabulary from other areas, including fruits, flowers, spices, nuts, types of wood, or metals. Trying to look for common ground, there are some words expert wine tasters habitually use. These words are not a tight standard, as several terms describe similar concepts and, some times, wine tasters give different meaning to the same word. This is not a wine describing dictionary. I hope the words listed below will help you to write more accurate tasting notes or, at least, to understand better those professional descriptions of wine you though obscure before. Acetic is that vinegar-like taste or smell born from exposure to air. Vinegar is acetic acid produced by fermenting wine. Acidic is a wine with too much acid. Wines contain acids, which vary in concentration. Ageworthy is a term applied to wines which will benefit from further maturation in the bottle. Typical examples are either young reds with powerful tannins or very sweet young whites. Acidity can also be a factor. Aggresive would be a wine acidic enough to make your gums tingle or with tannins in excess, so much that it would make the back of your throat feel dry. Ample would describe a wine that feels full and generous in your mouth. Aromatic will be applied to a wine with plenty more of perfumed, fruity scents -which normally you can appreciate before actually tasting the wine- than average. Grape varieties source of aromatic wines include Sauvignon Blanc, Riesling, Gewurztraminer, and the sweet Muscat. Astringent refers to the rough, rasping feel some wines have, usually caused by tannins, acid or both. The sensation of a dry mouth is strong - tannins produce this, a strong black tea would leave a similar sensation. High tannin content produces dry, puckering effect. Austere would be a wine without fruity flavors and with bitter tannins, which leave a rough, raspy feeling, high acidity, or both. Acidic means a wine has too much acidity; this is seen as a fault. All wines need some acidity to keep the balance, but too much and the wine tastes sour. Balanced - same as rounded - said of a wine it means all its elements are in perfect harmony and none stands out. Which elements? We are talking of the relative degree of acidity, alcohol, fruity quality, tannins, sugar, extract, and other characteristics. Big is a wine that makes a major impression, probably full-bodied, or a wine with intense aroma or plenty of flavor. To do so, the wine is likely to contain high levels of fruit, tannins, alcohol, or a blend of these. Everything in abundance, tannins, alcohol, acid and fruit flavors, a powerful wine. Bitter means harsh, unpleasant taste –perceived at the back of the tongue- typically caused by an excess of tannins in the wine. Not a trait to covet, with the exception of some red Italian wines, where some bitterness is a highly sought-after characteristic. Blockbuster equals to extraordinarily big - in the sense big is applied to wines. Hint: compare the feel of the wine to that of water. Body refers, talking about wine, to the feeling in the mouth, this weighty feeling is influenced by the alcohol and extracts contained in the wine. Wines are considered light, medium, or full-bodied. Bold s a wine that almost comes out of the bottle on its own, strong, very distinct aroma and flavor, easy to make out its different components. A wine has bouquet if it is complex of aromas, usually from aging. Buttery is a smell and taste that comes often to wines matured in oak barrels. Bright could be applied to a wine with vivid color or intense aromas and flavors. When a wine is described as cedary it has flavors or aromas that remind of the smell of cedar wood. Character in a wine, as it would be in people, means personality, substance and integrity. When a wine has strong flavor and plenty of tannin, but not that much that can be named as aggresive, you can call it chewy. Clean is said of a wine with no faults regarding aroma or flavor. Complex is a wine with many kinds of aromas and flavors –think of several fruity flavors, and hints of other traits such as vanilla or other spices- and many layers of flavor, as soon as you decipher one flavor, you discover a new sensation. Good wines are usually complex; great wines even more so. Complexity develops typically through aging, this maturing process lets more flavors to come out. Concentrated implies an intense taste and powerful feeling. That would be a wine with plenty of tannin, sugar, flavor and color. Cooked is a wine with a prunish flavor, usually from excessive heat. Corked is spoiled wine, smelling of cork, usually from cracked or seeping cork allowing introduction of air or fungi. Crisp, flinty, a wine with a perceptible acid feeling, but in the good, refreshing sense. Applied to white wines with a clean, fresh flavor -and good acidity, we said. Deep indicates a serious wine in which flavor seems to develop in many levels - doesn't this remind of complexity? - and where different hints of flavor, or aroma, surface at various stages of the tasting. Deep usually goes hand in hand with complex, subtle and rich. Dry, definitely not sweet, not at all. The wine does not have sugar or any sweetness that can be appreciated. Some dry wines with very ripe, fruity flavors or new oak flavors occasionally look like sweet. Some red wines that have spent too long in barrel or bottle, therefore losing their fruity flavor, are "dried-out." Driest of Champagnes: brut. Dull, a wine which appears blurred, or has indistinguishable aromas and flavors, not realy defined. Frequently consequence of an excessive contact with oxygen. Some red wines have an earthy, dusty taste. This is good if accompanied with good fruit flavor. Easy-drinking, meaning a more or less simple wine that can be enjoyed as it is, without thinking much about it; probably fruity, low in tannin, if red, and in alcohol content. In simple wines, the smell and taste of damp earth can be nice. These are earthy wines. The word elegant would describe an extremely pleasant to drink wine, with good quality, balance, a delicate expression and not excessively fruity. A wine with finesse. The extract is what gives body to the wine. It would include all the solid matter, either tannins, sugars, or coloring and flavoring chemicals. Fat or rich and unctuous, full bodied. If a wine has finesse, it is elegant; and a wine described as firm, is balanced, well defined. Just the opposite of flabby. Flabby or flaccid are negative terms usually applied to a wine with low acidity, and for that reason unbalanced. It might mean a syrupy, to the point of sickening sweet, taste; definitely feeble. A fleshy wine would feel thick, almost solid in texture, when drinking it --due to high concentration of fruit and extract. Focused in a wine means well defined, flavors and aromas are in place and can be identified. A wine labeled fresh would leave a crisp, slightly acidic - in a pleasant, refreshing way - impression. Nine out of ten times this term is applied to young white wines with plenty of cheerful fruit flavors and the correct level of acidity. A fruity wine, with plenty of pleasing fruit flavors, will have certain sweetness and be generally appealing. Particular fruits can be identified: aroma or flavor of apples, berries, citrus, currants, pears, etc. A heavy sensation in the mouth is one sign of a wine described as full. I have seen the term grassy often applied to New Zealand wines. Grassy means taste and aroma of fresh cut grass, some times redefined as capsicum, gooseberry or lime zest. Green could mean too young and immature -which is not good, or wine made from unripe grapes, producing tart flavor. If green is followed by gooseberry or apple flavors it would refer to the refreshing, zesty flavors found in som white wines -definitely good. Some red wines grown in cool climates also sport a subtle flavor of green leaves -also good. A hard wine is more than firm and less than aggressive in the tannins-red wine or acidity-white wine scales. A wine is labeled harsh when it is deficient in the subtlety department; it would feel coarse, rough when you taste it. It might be too acidic or high in tannins. Heavy means the wine is tough to drink, feeling like a dead weight in your mouth. It is usually applied to full-bodied red wines with plenty of tannins – white wines usually feel light by their own nature- and it may be a sign of a wine that would benefit from more time in the bottle. Herbal is the wine with aromas suggestive of fresh herbs, dried herbs or specific herbs. Honeyed, when the wine has a smell or taste reminiscent of honey, characteristic of wines affected by 'noble rot' (Botrytis cinerea). A red wine presenting the cooked flavor of fruit preserve - or jam - is said to be jammy. Lean, stringy or thin, all these words refer to a wine with high acidity and low flavor. A light wine has low acidity and little in the matter of body. A long wine has a lingering aftertaste. Madeirized refers to oxidized wine, with a brownish color and stale odor. After the island of Madeira where wine is intentionally produced in open air vats. Mature usually means a wine is ready to drink after having past the required time in bottle. In the same tune, over-mature would be saying "past its best." Unbelievable, but a few wines actually taste of meat. Meaty wines are likely reds, with stout and dense flavors. Mineral flavors are common in German wines and those of the Loire Valley, France. Imagine a taste of rock. Neutral, neither fish nor meat, little flavor or difficult to make it out. Noble wines are made from noble grapes, a classification of grapes that produce Cabernet Sauvignon, Merlot, Chardonnay, Sauvignon Blanc, Semillon and Riesling. A wine gets to the nose when it has aroma. Off-nose refers to odors indicating defect. Nutty wines are not mad, they just have a nutlike aroma, such as found in sherry or aged whites. An oaky - or oakey - wine has characteristics derived from oak, suggesting it has spent time in oak barrels; it feels toasty, smoky, buttery, smells charred, has vanilla flavors, or has a higher tannin content it would have otherwise. It could be used as a negative term when oak flavors rule over other flavors in a wine, as oak flavors are only desirable if they are balanced by fruit. In this case, and if we are talking about a young, good quality wine, it might loose some oakiness spending some years in bottle. Oxidized is a wine spoiled from over-exposure to air. Petrol flavors are similar to mineral but in this case is associated to mature wines from Riesling and it is considered positive. Piercing if having lively fruit flavors - positive - or high acidity - not so. A powerful wine would possess and abundance of everything: high levels of extract, alcohol, or both. It feels big, even larger than life. Powerful can be an unwanted characteristic in some wines. Racy wine is lively, spirited, crisp and fresh; as such it is noticeably acid but it is stimulating and refreshing. Racy is often associated with German wines. Rich wine feels intense, concentrated, deep… full flavor vibrating in your mouth. Rich may be used to define a slightly sweet wine. A wine can have too much of a good thing and become too rich, too sweet. Ripe is a wine made from well ripened grapes, with good fruit flavors; it might even have hints of fruits from warm climates - taste more of pinapple than apple. It might feel sweet even if does not have sugar. Rounded, almost equivalent to balanced, is a wine with all elements in place, complete. Satisfying flavors, no surprises or sudden sharpness. Simple is the wine lacking in complexity, no layers, plain aroma and unidimensional flavor. This is expected of everyday wine - table wine - but it is a terrible fault in an expensive wine. Smooth or soft, a qualifier applied to red wines with mild tannins or low acidity whites, easy to drink wines both of them. 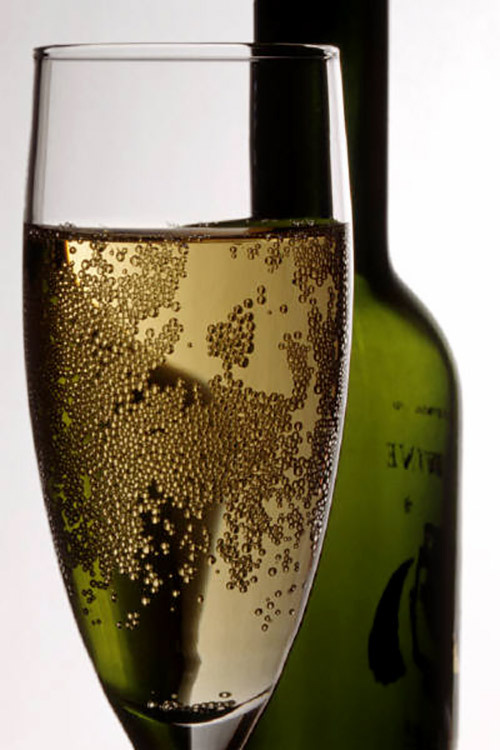 Sparkling wines contain carbonation, such as does champagne. Spicy is applied to Australian wines sporting a taste of cinnamon, cloves or pepper, and also to Gewürztraminer wines usually full of exotic aromas and flavors. Steel flavor is found in a wine firm and lean with a good acidity. Stony flavors are similar to the mineral ones, minus the thrill. Structured is a red wine with fruit flavors well supported by the tannins or a white where fruit flavors stand up to the acidity. Subtle is usually associated to finesse or an elegant wine, the fragrances or flavors are hinted, with plenty of notes in them -posirive. It has been applied to wines lacking fruit flavors - negative. Sulphurized is when there is a noticeable sulphur flavor. Sulphur is an anti-oxidant introduced in some wines in small amounts. Fermentation creates minute amounts naturally. A supple wine, like a supple body, is both vigorous and smooth. This refers to texture rather than taste. Sweet either a wine with plenty of sugar, or plenty of rich and ripe fruit flavors. There might be residual sugar from fermentation, from grape sugar incompletely converted to alcohol. Tannic is a wine with an abundance of tannins - the chemicals coloring skins and stems in the grapes. This is not bad if balanced by fruit. Sometimes the wine is simply calling for extra maturation. Tart apples have a sharp, unripe, acid taste, so does tart wine. Toasty is one of the flavors resulting of oak ageing, like the flavor of a buttered toast. An up front wine is uncomplicated, easy to drink; probably full of simple fruity flavors. Wines with excess of alcohol can certainly make you feel warm, but the term is also applied to some red wines with a full-body, tangy flavor and deep, velvety color. Woody is having the aroma or taste of aging barrels. Yeasty means smelling similar to bread. Yeasts are introduced to carry out fermentation and can be incompletely removed. Appellation is the French system regulating authenticity; applies to region where the grapes were grown. Balance is the relative degree of fruity quality, acidity, tannins, alcohol and other characteristics. Cooper is a maker of casks or barrels. Nose means aroma in wine speaking. 'Off-nose' refers to odors indicating defect. Sommelier is a specialist in selecting and serving wine. Sulphur is an anti-oxidant introduced in some wines in small amounts. Fermentation creates minute amounts naturally. See sulfites. Vintner refers to a winemaker. Viticulture is the art and science of growing wine grapes. Vitis vinifera is a plant species encompassing most traditional European wine grapes. (1) Cabernet Sauvignon: grows in a variety of climates, but most closely associated with Bordeaux, France. Produces wines usually high in tannin. (2) Chardonnay: from Burgundy, France. Classic and popular. (3) Chenin Blanc: from France's Loire valley. A white grape, grow in climates too warm for many vinifera types. (4) Grenache: Spanish grape with raspberry-like flavor and fruity aroma. (5) Merlot: produces deep colored, high alcohol wines with low tannin. Sometimes chocolaty. (6) Nebbiolo: from Piedmont, Italy in the northwest, produces Barbaresco and Barolo. High in acidity and tannins. (7) Pinot Noir: difficult to grow, low in tannin, prone to rot. (8) Riesling: a traditional German grape from the Mosel region. (9) Sangiovese: produces herby, spicy Italian wine from Tuscany, Italy. (10) Syrah/Shiraz: from France's Rhone valley, but more recently Australia and New Zealand. Spicy, sometimes reminiscent of black pepper. Not to be confused with Petit Sirah, a California grape. Vinegar, produced when wine ferments, is acetic acid.